I'm having some pretty bad drivetrain noise. Sounds like pinion mesh too tight on a 2 wheeler. Diffs shimmed good. Spur/pinion mesh good any pointers? Is yours quiet? Grease? Shaft cars with metal ring/pinions are almost always more noisy. There's several of these running at my local track. Most are a little noisy, a couple sound like old power drills. I think the RC8B3e is the better starting point for such a mod. 1/10 4WD platform is too weak. I remember the Durango DESC410. Fast but very fragile. ifyou do a conversion like the Mugen ones could have a 4wd SCT that way. Durangos DESC10 was basically that. So what are some of the durability items that seem to be recommended how? How many of you guys have done the long rear tower/31mm shocks? As noticeable an improvement as on the B6? I did that about a week ago. The first day I ran it I totally forgot I changed the rear tower and shock bodies the night before. Typically I need to make changes at the track and test back and forth to really know the difference. Because there was a few days between each style I can't honestly say the shocks changed anything, but I need to try both options back to back on the same day. The car is so freaking good overall that I have continued with the long tower and mostly just forgot they are there. daedalus and dodomic like this. I had another full day with the 64 and happy to report nothing broken! Really getting used to her now. 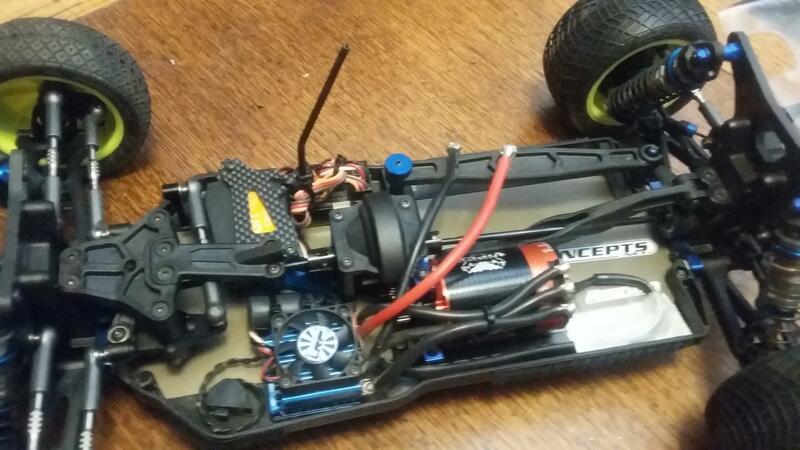 Car felt great and jumps with ease very predictable in the air.Runn n 10,200,10, gold kyosho rear springs.Shocks outside bottom middle up top. Car really like to be pushed hard. Ok I'm not going to worry about it then. It's a plastic spur gear, Maybe its the compound. If a delrin one comes as part of the aftermarket I'll pick one up. It is a little disconcerting thats all. The car performs great. So anybody elses chassis flex a lot in the middle? 2 B64 in the top 10 on the EOS on high bite carpet track. with the B6 and B64 Asso in making his comback in europe. I had another race day with the B64. I finished 3rd because everybody else broke. 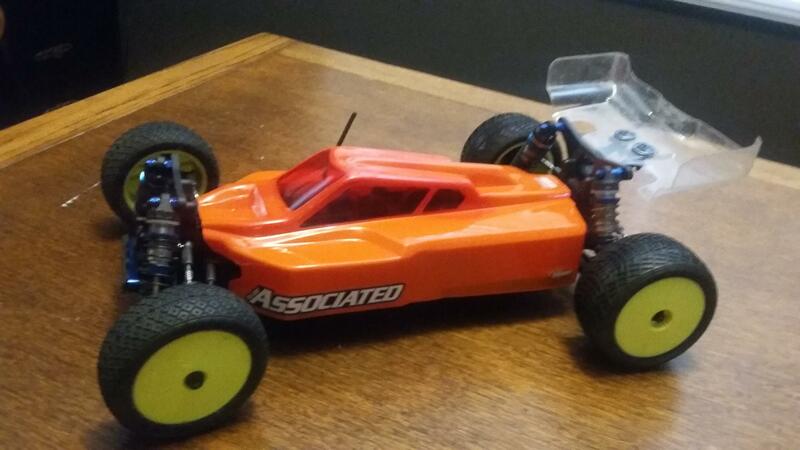 My honest and unbiased opinion is that out of the box the TLR 22-4 2.0 is a better car. It pains me to say that as I absolutely hate and despise Losi stuff but they got it right the second time around. You can buy the 2nd version of the 22-4 and run it almost anywhere with the box set up and win, not just be competitive, but win. Can't do that with the B64. Fast guys are going to be fast with whatever car they have but the rest of us have to rely on set up. Associated failed in that respect. They knew what they had to achieve before the car was released and they didn't deliver. It doesn't matter that other cars have been out longer. This one is new and needed to be better, its not. I am not fast but I am very consistent. The only reason that I finished well today is because I drove very conservatively and instead of letting it rip I cruised around the track trying not to hit anything. A lot of other guys have already broken a lot of parts. Today I saw an arm, a tower, both, and the front gearbox/bulkhead. The best part is that almost none of that stuff is available! I am an AE fan and will continue to try to make the car work but I'm not afraid to admit the truth. I can pull out my 22-4 2.0 with the kit set up and run better. If the B64 is so much better with 13 degree caster blocks [or whatever] it should have come with them, if it could run better with different springs it should have come with them, and if simple tuning could have made it better the kit setup should be better. I think the design offers enough advantages over the competition but the execution isn't there. The bottom line is that I'm more annoyed than impressed. AE needs to improve the plastic that they are using and they need to make the stock set up better even if that means including different parts. If I had to grade the B64D I'd give it a B or B-. Its not a bad car but its not good enough. I'm ready for the flaming to begin from folks that have not owned an XB4 or 22-4......lets hear it. I'm ready. ZEe_NYC, iTz Nicholas72 and Coke in a can like this. For me the box setup was twitchy. Just lengthening the front camber link fixed that. At this point the car was very easy to drive. I just made a few changes yesterday and the car was stand out faster than anything at the track. I was able to TQ and win without an issue. I have never owned the new xb4 but I did have the 1st one. It wouldn't be fair to compare as it was there old car. As of this time though, the B64D is the best wheeler I have driven. I have owned many. Nothing has been as fast or accurate on the track. My ZX6 was good but there is just something I like better with the B64. I give it 5 stars. A lot of people were coming over to look at my car. Box set up though is not the best though. Too darty. Last edited by protc3; 03-20-2017 at 06:07 AM. I enjoyed QDRHRSE's analysis and would agree. Out of the box is just okay, which isn't okay for a lot of people. Personally, I never go by out of the box setups. Whenever I get a new (or new to me) vehicle, I run it regularly for 6 months before I'm willing to give up on tuning it. If a car is great out of the box, that's a small bonus to me. I don't know what goes into Associated's tuning process for kit setups, but the only car I've ever really liked out of the box from them was the b4.2 WE. Of course, they had literally a decade to get that setup figured out. The B64d is okay out of the box, but I honestly believe it has the correct overall geometry and tuning options to make it drive any way you want it to. Some cars don't, but I don't think that's the case here. I just finished my B64D build. Not much to mention, as it was pretty good and straight forward. Had to sand the front arms a little for free movement. Was short a few diff shims (but I had some laying around). Went through some Chapstick threading screws in. But overall I was satisfied with the build. Oh, and I didn't like the tiny grub screws for the sway bars so I used 3x5mm instead of the 3x3mm (not the ones in the aluminum couplings, but rather the ones that go in the plastic piece on the diff case). Hopefully I will get to see how it drives this Saturday. Last edited by slakr; 03-20-2017 at 06:01 AM.